Heat oil in a large, shallow skillet. Saute the onion and shallot until just beginning to soften. Add the beef until the fat starts to render, breaking the meat into small bits. Drain off the fat. Add the Worcestershire sauce, salt, pepper, paprika and stock. Simmer until the stock has totally evaporated. Serve sprinkled with onion on buns with a smear of mustard. Steamburgers are the signature dish at Stewart's Root Beer out on Pulaski Highway just outside of Baltimore. My grandpop used to tell me about getting them long before I or even my mother was born. If that doesn't make a family tradition what does? They are basically a loose meat sandwich, sort of like a sloppy joe but without the sauce. Served on a soft bun with onions and a smear of mustard or with cheese melted on, they are a bit of retro heaven. I've heard of similar sandwiches sold in other parts of the country but I've never encountered them outside of Stewart's which not only has been serving steamburgers since 1945 but draft root beers, regular burgers, chili dogs, fries and summery side dishes like coleslaw and potato salad. 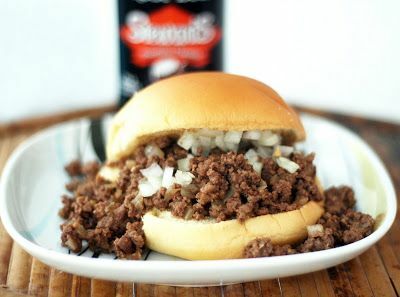 Stewart's is only open 6 months of the year (the warmer months) so I've long wanted to develop a recipe so I can eat a steamburger whenever the mood strikes. It took some experimenting but I think I've come as very close to the taste of the original as I could but like many homemade versions of fast food is a lot less greasy. (Sorry, Stewarts!) It is very meaty and juicy but fresh tasting. If you are still not convinced, steamburgers taste very much like a traditional hamburger but in a more rustic, crumbly form.